Australia is often thought of as a laid-back nation whose relaxed citizens seem to be on permanent vacation. Perhaps this carefree attitude is due to more than 90% of the population living within the siren call of the beach. While much of their culture has been formed by an outlook based on surf and sand, the country has also experienced dark days and challenges throughout its history. 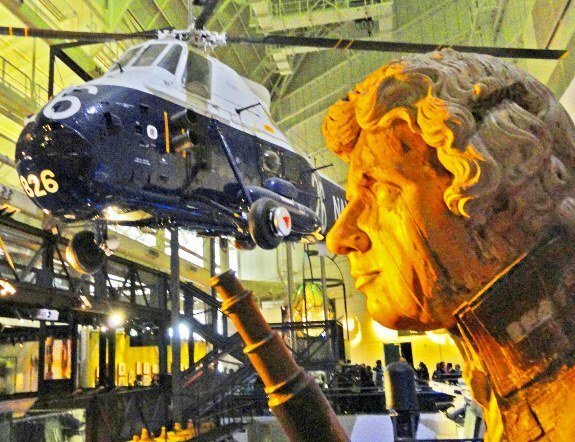 There are several sights in Sydney that highlight the country’s military legacy. 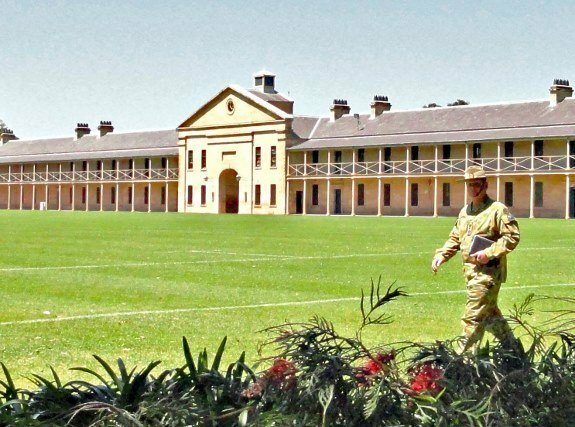 A good place to start is at the Victoria Barracks, located on twenty-nine acres in the neighborhood of Paddington. 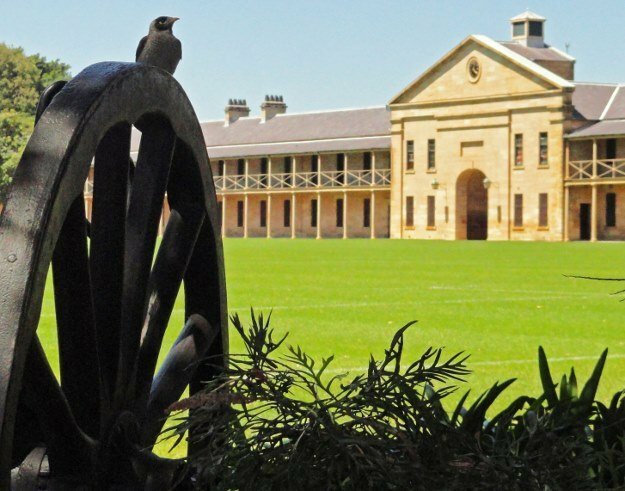 Built in the 1840s by mostly convict labor, the colonnaded sandstone buildings are one of the finest historic barracks in the world. 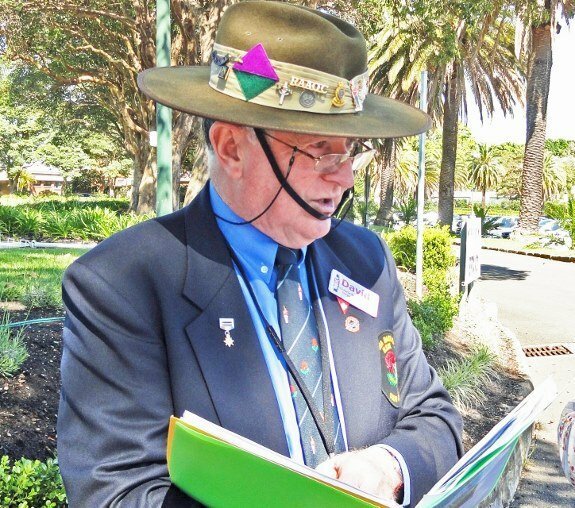 Free tours are offered on Thursdays by the Victoria Barracks Corps of Guides, retired veterans wearing khaki Army slouch hats and blue blazers. Our guide, David, started our tour in the Guard House with a visit to the four cells that held “drunken and outrageous persons.” This being an Army base with young soldiers away from home, the cells were eventually expanded into another building. David pointed out a metal badge on his cap and explained the significance of the crown in the center of the Australian Army symbol. The current logo has a female crown (yes, male and female crowns are different) representing the reigning monarch Queen Elizabeth II. He pointed out that after “Lizzie goes” the logo will be updated to show a male crown for King Charles, or perhaps King William. Loyalty to the monarchy lives on in the Australian Army. 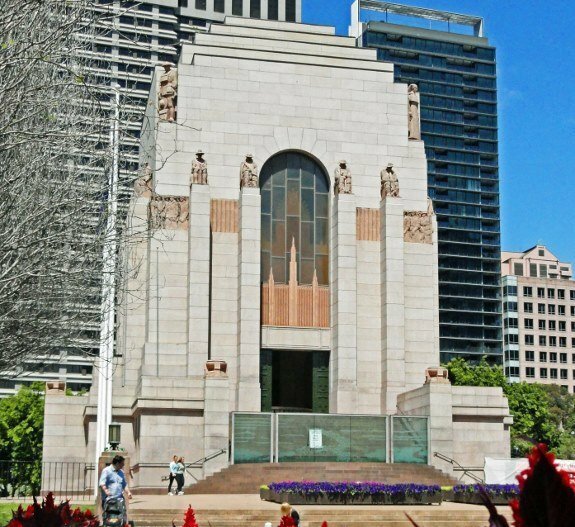 The ANZAC Memorial is located in Hyde Park in central Sydney. 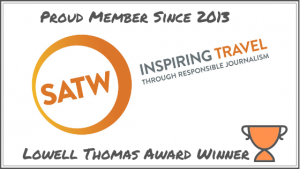 The term ANZAC is a revered one. It refers to the Australia New Zealand Army Corps that fought on the shifting sands of the Gallipoli Peninsula in Turkey in World War I. It turned out to be a disaster; the soldiers were pinned to the beach and under constant enemy fire for eight months, only to be evacuated with tremendous losses. The square, 98-foot tall Art Deco memorial is clad in pink granite quarried from nearby Bathurst. 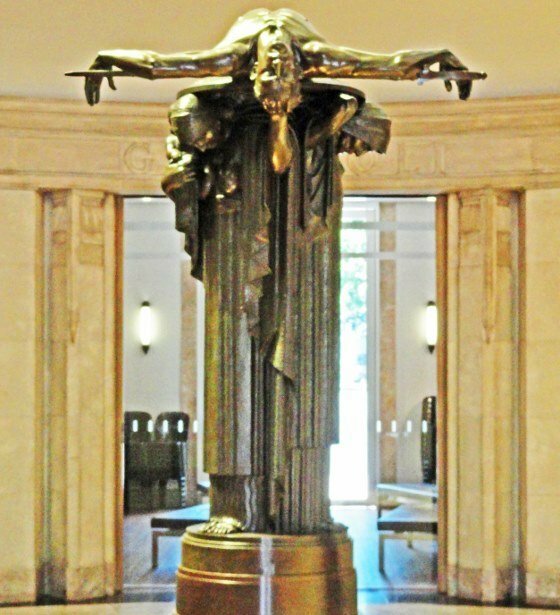 The interior’s main focus is a poignant statue of a soldier, whose lifeless body lies on a sword and shield, being held aloft by three women and an infant representing mother, wife, sister and child; those who were left behind by the brutality of war. The cruciform base of the Memorial houses a museum dedicated to Australia’s military history right up to the Gulf War. In the World War II section we were drawn to the display of Warrant Officer GN Milne’s diary; he was stationed at a hospital in Darwin, Australia when it was damaged by Japanese bombing raids. The last stop on our personal military campaign of Sydney was the Australian National Maritime Museum; perfect for a nation that is defined by the sea. 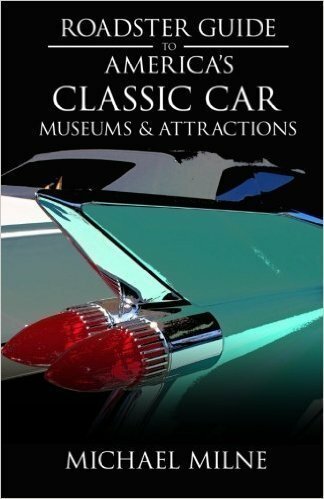 The exhibition combines the finest aspects of a traditional museum—glass cases chock full of memorabilia—with the hands-on features of a “Please Touch” display. The interactive displays include one where the visitor plays the role of a submarine sonar technician trying to decipher garbled underwater sounds. The player guesses what each sound represents and is promoted (or demoted) based on their response. We kept at it for some time until we could finally tell the difference between a group of porpoises and a damaged piston rod. At this point we had been to enough sobering military displays for one day. Fortunately the Maritime Museum also has an exhibit devoted to the nation’s surfing heritage. This is the Australia that lives on in foreign perceptions of the country. While the typical Australian’s outlook on life is pretty sunny, it is a nation that has witnessed dark clouds as well. In one day we were able to witness both sides of Australia. A nation that was forged on the sands of Gallipoli was later nurtured on the sands of its beaches to create the vibrant country that it is today. Location: Oxford Street in Paddington, a ten-minute bus ride from the center of Sydney. Buses 378, 380 and 382 stop right in front. Location: Darling Harbour in Sydney. 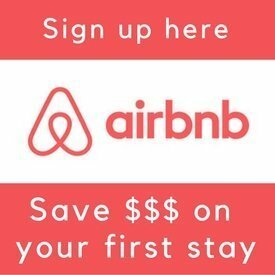 Easy access from the city center by foot, bus, light rail, ferry or monorail. 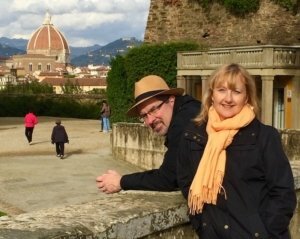 To follow our journey around the world in search of the tasty and quirky and receive valuable travel tips “Like us on facebook” or subscribe.